Home/Rock Solid Sports/Who Is The Saints Utility Man Opening Eyes Across the NFL? 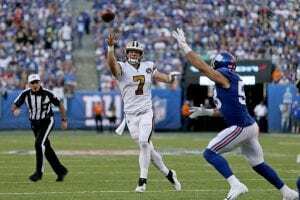 On the New Orleans Saints first offensive possession of the 2018 NFL season they orchestrated a brilliant drive and marched right down the field against the Tampa Bay Buccaneers. They where faced with 3rd down and two, from the five-yard line. It’s a perfect situation. 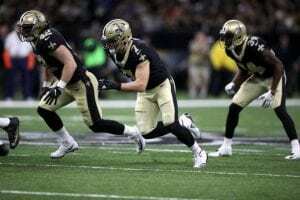 With talent littered all over the field including, Rookie of the Year, Alvin Kamara, All-Pro wide receiver, Michael Thomas and let’s not forget, Super Bowl winning quarterback, Drew Brees, the Saints could do virtually anything they wanted to on the ensuing play. So, what did head coach Sean Payton do? Into the game comes a slightly more muscular looking Drew Brees wearing number seven. He lines up in the shotgun alongside Kamara. The stranger receiving the snap looks to his right and sees veteran defensive end Vinny Curry awaiting unblocked and ready to pounce. Hill reads it perfectly and hands the ball off to Kamara. The running back scampers up the middle untouched to the house. Hill has continued to see action at quarterback in the last few games subbing in at odd times and running a multitude of different plays— some successful, some not so much. 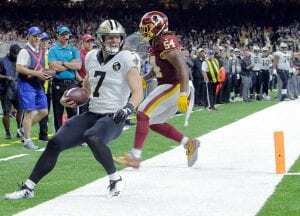 Eventually, in the third quarter of the Saints week five matchup against the Redskins, he subbed in on a first and goal play from the one-yard-line. The play was a quarterback keep run to the right and Hill sprinted to the pylon for the New Orleans score marking Hill’s first NFL touchdown. Hill’s journey to that touchdown has been a long and winding path and riddled with injuries. In high school, Hill was known not only as a quarterback but as a freak athlete. He originally committed to Stanford to play for Jim Harbaugh, but eventually decommitted and signed with Bringham Young University. Before he could attend school and play football, he had to complete his mission required by his Mormon faith. He spent two years in Sydney, Australia before returning home and playing for BYU. While with the Cougars, Hill suffered season ending injuries in each of his four seasons, with three of the injuries coming during games against Utah State. With severe injuries to his knee, leg, foot and elbow, Hills draft status was nonexistent. Following his redshirt senior season in 2016, Hill participated in BYU’s pro day where he began to appear on NFL scouts’ radars. With his 6 foot, 2 inch, 230-pound frame, Hill ran a 4.44 second 40-yard dash and showed off a 38-inch vertical leap. 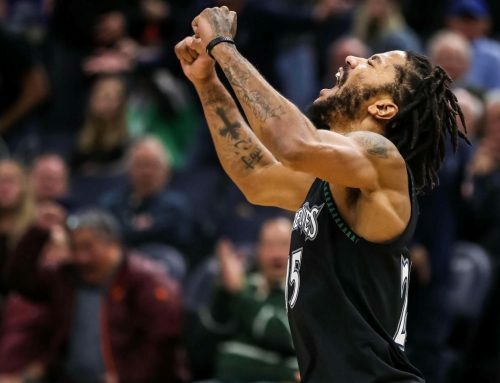 His stature and athletic ability intrigued general managers across the league, but no one knew exactly what they could do with him. He didn’t seem fit to play quarterback in the NFL, but he didn’t really have any experience playing anywhere else on the field. However, he was such a good athlete that he had to fit somewhere but where? No team spent a draft pick on Hill, but he signed as an undrafted free agent with the Green Bay Packers shortly after the 2017 draft. Green Bay waived Hill in hopes to claim him off of the waiver wire to keep him on the practice squad. That’s when the Saints swooped in and picked him up. Hill went to New Orleans and spent most of last season on the practice squad until being pulled up as a special teams player in early December. Last offseason, Hill had his sights set on becoming the number two quarterback on the Saints’ roster behind Brees. Hill thought he was the man for the job until August 29th when the Saints traded for Teddy Bridgewater who immediately leapfrogged Hill on the depth chart. However, that wasn’t the end for Hill. Actually it was only the beginning. Sean Payton had other plans for the 28-year-old second year player. Payton has long been recognized as an out-of-the-box thinker when it comes to NFL coaches. His offensive schemes and daring risks are what have led to him being one of the longest tenured coaches in the league. That’s when Payton started developing certain packages (especially in short yardage situations), that involved subbing in Hill at quarterback. This isn’t the first time Hill has been used in this capacity. During his Freshman campaign at BYU, he played a similar roll for the Cougars. With Payton, the ideas didn’t stop flowing there. Instead, Payton tried to see how many different ways he could get Hill involved in the game. Hill brought something unique to the table in the eyes of Sean Payton. With Hill, Payton didn’t see a backup quarterback or even a run of the mill utility player. He saw a utility man unlike any other in the league. A lot of utility players in the NFL are guys that consistently play special teams and can play linebacker and occasionally step in at tight end in some situations. But Hill is different. He can do virtually everything that other utility men can, but at his core, he is a quarterback. Halfway through the season and Hill has appeared in so many different roles that it is tough to keep track of. Is Hill going to walk over to kicker Will Lutz and say, “yeah man, you stay on the sidelines for this one. I’ll kick the field goal.” At this point, nothing would be surprising. As it stands right now, nobody really knows exactly what Taysom Hill is. 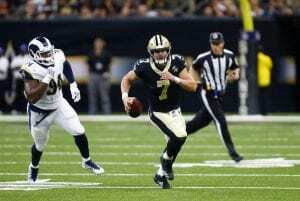 Taysom Hill might not even know exactly what Taysom Hill is. Maybe he’s a quick fad. Maybe he’s a flash in the pan. Or maybe…just maybe he’s a trailblazer.